A portrait of Marie Leszczyńska by Jean-Marc Nattier. Marie Leszczynska , Queen Consort of France, was born in Trzebnica, near Wroclaw, in Lower Silesia on June 23, 1703. She was the daughter of Stanislaw Leszczynski (who in 1704 was elected king of Poland with the support of Charles XII of Sweden) and of Catherine Opalinska. During a temporary flight from Warsaw the child was lost, and eventually discovered in a state; on another occasion she was for safety’s sake hidden in an oven. In his exile Stanislas found his chief consolation in supervising his daughter’s education. Her youth, though, was marred by her father’s misfortune. In 1709, Stanislaw was deposed after Swedish army lost the military upper hand in Poland. They first settled in Sweden and then in Zweibrücken , the fiefdom of King Charles XII, the income of which was used for the family’s sustenance. With Charles’ death and Zweibrücken’s passing to a cousin of his, the family settled at a town house in Wissembourg with financial support from the French Regent, the Duke of Orleans. 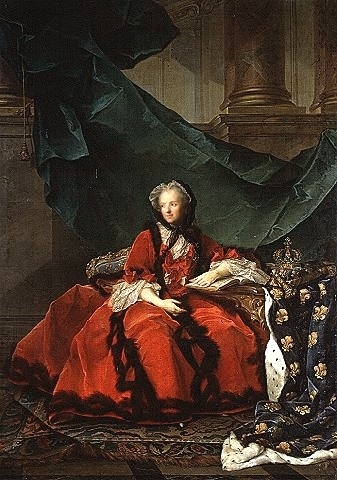 It was Marie Lesczcynka’s lack of political connections that made her one of the 99 ladies who were deemed eligible to marry the young French King, Louis XV. Of the four princesses shortlisted, her name emerged as the most desired, thanks to the influence of the Duke of Bourbon. The King and the former Polish princess were engaged on April 2, 1725. Not even the protestations of the courtiers who thought of the bride as one from a lowly birth hindered their wedding at Fontainebleau on September 5, 1725. A portrait of Louis XV by Hyacinthe Rigaud. The couple’s relationship started out as a happy one. 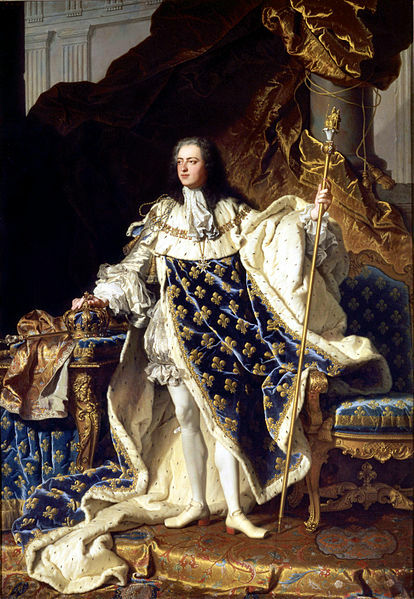 In fact, Louis XV was faithful to her for the first eight years of their marriage. Despite their age gap (Marie was seven years older than Louis), the King was enthusiastic to have her as his wife and he never allowed anyone to criticize his wife her plain appearance. Marie gave birth to 10 children, seven of whom survived to adulthood. They were: Louise Élisabeth (1727 – 1759), who became Duchess of Parma and had children; Anne Henriette (1727 – 1752), who died unmarried; Marie-Louise (1728 –1733); Louis, Dauphin of France (1729 –1765), who married, first, Infanta Maria Teresa Rafaela of Spain and had issue, and after her death he married Duchess Marie-Josèphe of Saxony with whom he also had issue; Philippe of France, Duke of Anjou (1730 –1733), who did not survive childhood; Marie Adélaïde (1732 –1800); Victoire Louise Marie Thérèse (1733 1799); Sophie Philippine Élisabeth Justine (1734 –1782), who also died unmarried; Marie Thérèse Félicité (May 1736 –1744); and Louise Marie (1737 –1787). While the Queen was not ugly, she looked rather plain and simple for a queen. She gradually lost her healthy complexion as she became pregnant with one child after another. Her piety also prevented her from indulging herself in vanity. She was extremely shy even to her husband; she revered him to the extent that she could not relax enough to entertain or flirt with him. Marie Leszczyńska and the Dauphin Louis by Alexis Simon Belle. She made her first and only attempt to interfere in politics in 1726 when she supported the Duke of Bourbon to prevent his disgrace from office. This act drew the ire of Cardinal de Fleury, who exerted influence over the King. The Duke of Bourbon was dismissed and, thereafter, she stayed out of the King's affairs and played no further political role. As the king’s attention and affection gradually shifted to a series of mistresses, the Queen spent more time on charitable works. She helped spread the devotion to the Sacred Heart and founded the Queen’s Convent (later Lycee Hoche) in Versailles to help girls from poor backgrounds obtain education. A very cultured lady, she enjoyed fine food and was noted for her good sense of humor. She was happiest with her small but intimate circle of friends , which included her grand almoner Cardinal de Luynes, Duke Charles Philippe d'Albert de Luynes , Marie Brûlart, her Dame d'honneur, , Duchess de Mazarin, her Dame d'atour, Francoise de Mailly, President Hénault, her Surintendant, and Count d'Argensson. She enjoyed reading, drawing and music. The concerts she organized in the Peace Room became popular in the Court, one reason why the musical environment in Versailles flourished during her husband’s reign. While the Queen’s children adored their mother relationship with her children shifted from tepid to cool. In fact, her interaction with them was only limited to the ceremonial activities which were very much a part of day-to-day life in the Court. Marie Adélaïde and Victoire, collectively called the Mesdames, recalled that this coolness with their father’s warmth and affection towards them. 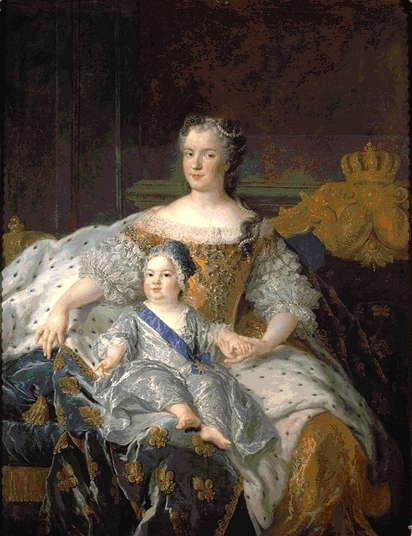 The Queen nonetheless oversaw the moral and religious education of her son, the Dauphin Louis-Ferdinand, who died prematurely in 1765. Despite her misgivings as a mother, Marie Marie Leszczyńska was very popular among her subjects and her death on June 24, 1768 was a huge blow to the King and the French monarchy who was already reeling behind unpopularity due to the excesses of the court and plight of the peasants. The Mesdames survived long enough to endure the downfall of the Bourbon monarchy, successfully fleeing France at the onset of the French Revolution. Clarissa Campbell Orr (2004). Queenship in Europe 1660-1815: The Role of the Consort. Cambridge University Press. Latour, Louis Therese (1927), Princesses Ladies And Salonnieres of The Reign of Louis XV. Norrhem, Svante (2007). Kvinnor vid maktens sida : 1632-1772. (Women alongside power: 1632-1772) Lund: Nordic Academic Press.